Shavkat Mirziyoyev was born on July 24, 1957 in Zaamin District of Jizzakh Region to a family of doctors. He is an Uzbek by nationality, with higher education. In 1981 he graduated from the Tashkent Institute of Engineers of Irrigation and Mechanization of Agriculture and earned a degree in mechanical engineering. He holds a Ph.D. in Technical Sciences, Associate Professor. Shavkat Mirziyoyev started his career in 1981 at the Tashkent Institute of Engineers of Irrigation and Mechanization of Agriculture, where he served as a junior research fellow, senior lecturer, associate professor, and the vice rector for academic affairs. In 1990 he was elected deputy of the Supreme Council of the republic. He served as Chairman of the Credentials Committee. In 1992 Shavkat Mirziyoyev was appointed khokim (governor) of Mirzo Ulugbek District of the city of Tashkent. In 1996-2001 he served as khokim of Jizzakh Region, in 2001-2003 - khokim of Samarkand Region, and made a great contribution to the socio-economic development of the aforementioned district and the regions. While working in the executive branch and at the same time as deputy of the Oliy Majlis of the Republic of Uzbekistan in 1995-2003, he has actively and fruitfully participated in the elaboration and adoption of important legislative acts on political and socio-economic development of the country and implementation of democratic reforms. 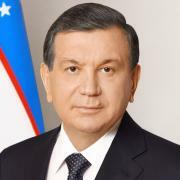 Shavkat Mirziyoyev was approved as the Prime Minister of the Republic of Uzbekistan in 2003, and three times (in 2005, 2010 and 2015) was approved again in his post by both Chambers of the Oliy Majlis. From the early years of our Motherland’s Independence Shavkat Mirziyoyev earned a high trust of the first President of Uzbekistan Islam Karimov, by selflessly working as his colleague and close associate. As head of the Government, he has shown tremendous abilities and outstanding leadership in implementation of wide-ranging socio-economic reforms, modernization and improvement of the country, realization of major and unique projects, development and protection of private property, radical increase in the share of small business and private enterprise in the economy and consolidation of their legal security. In his activities Shavkat Mirziyoyev attached a special significance to economic development on the industrial basis, improvement of the country’s exporting potential, cardinal transformation of the agricultural sector, especially the extensive advancement of farming enterprise, profound processing of agricultural products, provision for food security of the nation and the guaranteed supply of goods to the population at reasonable prices. In order to drastically uplift the living and working conditions of people, Shavkat Mirziyoyev took effective measures for large-scale construction and improvement works in all regions of the country, to improve the quality of public services, integrated development of cities and districts, including the remote rural areas. In his activities, along with socio-economic dimension, a significant emphasis is placed – as a priority focus – on the progress of education, science and healthcare in accordance with modern requirements, creation of conditions necessary for the formation of healthy and comprehensively advanced younger generation, protection of motherhood and childhood. He has paid much attention to further enhancement of the credibility of the unique institution of self-government – makhalla, other social organizations, consistent consolidation of their role in the community through broad involvement in the process of democratic reforms, as well as the preservation and enrichment of national spiritual values. Along with this, in addressing the economic and social issues Shavkat Mirziyoyev directly supervised the efforts to build up comprehensive mutually beneficial cooperation with other countries, international organizations and financial institutions, as well as important agreements that serve the national interests and economic development of the country. On September 8, 2016, on the basis of a joint resolution of the Legislative Chamber (Lower House) and Senate of the Oliy Majlis (parliament) of Uzbekistan adopted at the joint session, Prime Minister Shavkat Mirziyoyev was temporarily assigned the duties and powers of the President of the Republic of Uzbekistan. On October 19, 2016 the Movement of Entrepreneurs and Businessmen — Liberal- Democratic Party of Uzbekistan (UzLiDeP) during its Eighths Convention in Tashkent nominated the member of Political Council of the Party Shavkat Mirziyoyev as its candidate for the presidential elections. Shavkat Mirziyoyev was elected President of the Republic of Uzbekistan with 88,61 percent of the vote based on the results of the presidential elections that took place on December 4, 2016. Shavkat Mirziyoyev officially assumed the post of the President of the Republic of Uzbekistan on December 14, 2016. Shavkat Mirziyoyev is married; with two daughters, one son and five grandchildren. His spouse, Z.M. Mirziyoyeva, has a qualification of an engineer-economist. At present, she is a housewife. In recognition of many years of productive work in the Government and management, enormous contribution to the development of the country, improvement of the people’s welfare, Shavkat Mirziyoyev was awarded the Order “Mekhnat Shukhrati” (‘Glory of Labor’) and “Fidokorona Khizmatlari Uchun” (‘For a Selfless Service’).